At the top of the Calculations section, the EDIT button is available. This allows you to display a window for creating and editing calculation rules. The upper part of the window serves to manage the definition of the calculation definition. Use the CLEAR button to delete all defined rows at once. The definition of the calculation consists of one or more lines which determine under what conditions the value should be added to the result. The value from a given row is added to the result only if all the conditions on that line are met. If the conditions are met on multiple rows at one time, the result is added to the result from each such line. Conditions can be defined by activating fields in individual columns. What value should be added when the conditions are met is determined in the "TO ADD" field: it is still possible to determine how many times the determined value should be added. The next figure captures the definition of the calculation, when the difference is added to the result depending on the win / draw / loss and the other in the home and the outside. For example, for a away draw result, the value of 7 is added. The following figure captures the calculation based on the goals difference in the previous matches. The difference of the goals is always calculated from the point of view of the given team, ie the difference is negative in the case of a loss. The calculation is defined so that, for example, when winning away, the result is added to 1.5 times the goals difference. Similarly, when the home team lost the match, it is also calculated as 1.5 times the difference of goals (ie, the result of the calculation is reduced, or the difference in the goals is negative). The average is returned (see option at the bottom) calculated for all matches where at least one specified condition has been met. In order for the Calculation values to be available in the Offer window, new columns must be activated in the Filter / Columns section. 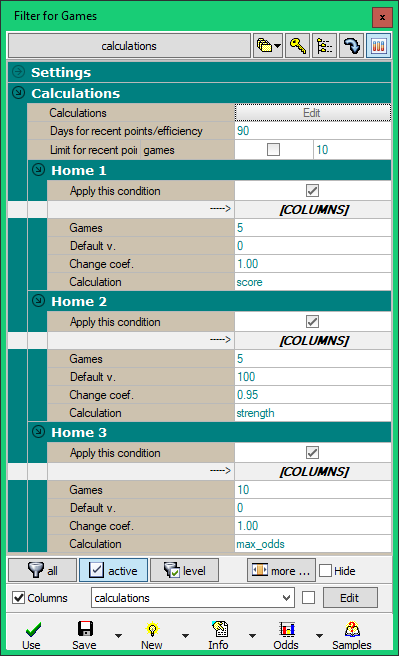 For each calculation two column are available: withs the calculation result itself and the number of matches where at least one specified condition is met. 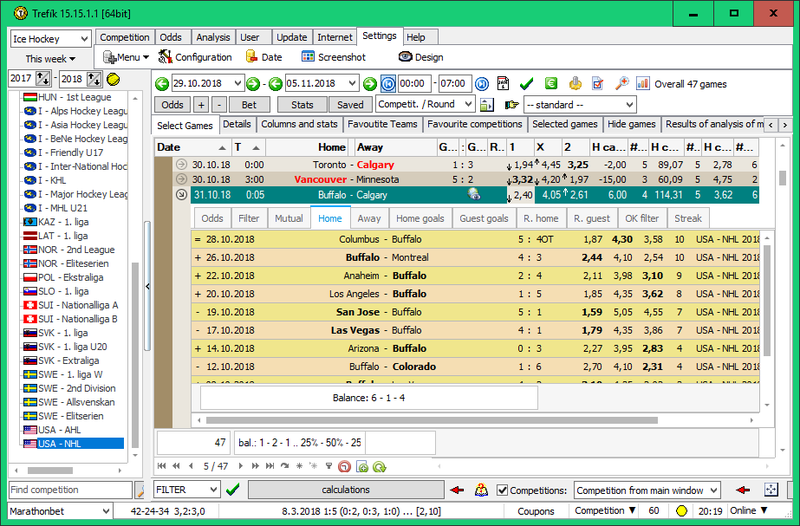 the third calculation for Buffalo searches for the highest odds for Buffalo during its 10 recent matches when Buffalo has won. (please notice: when searching for the matches always as the maximal limit is taken the number of days entered at Filter / Settings section .. so 10 recent matches needs to be within that limit). The returned value is 3.62 from the away victory over Los Angeles.